Waste Decomposer – HCM Agro Products Private Ltd. 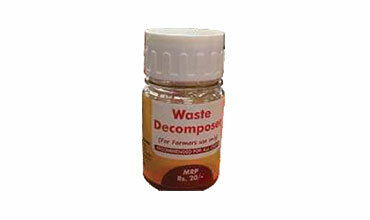 Waste Decomposer works as biofertilizer, bio-control and as well as soil health reviver. It is used for quick composting from organic waste, soil health improvement and as plant protection agent. It is a consortium of micro organism extracted from desi cow dung. This product support organic revolution and gives enough credibility and strength to the motive of chemical free agricultural practices. Mix 2 kg of jaggery 200 liter of water in a container and stir well. Stir the contents of the container and cover it with a paper/cardboard stir it daily once within 4 days the material is ready.